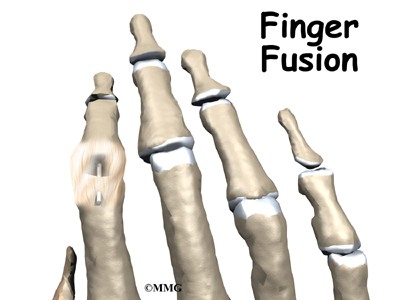 Arthritis of the finger joints may be surgically treated with a fusion procedure. Fusion keeps the problem joints from moving so that pain is eliminated. The finger joints work like hinges when the fingers bend and straighten. The main knuckle joint is the metacarpophalangeal joint (MCP joint). It is formed by the connection of the metacarpal bone in the palm of the hand with the finger bone, or phalange. Each finger has three phalanges, separated by two interphalangeal joints (IP joints). 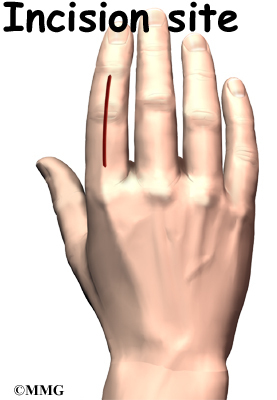 The one closest to the MCP joint (knuckle) is called the proximal IP joint (PIP joint). The joint near the end of the finger is called the distal IP joint (DIP joint). Ligaments are tough bands of tissue that connect bones together. Several ligaments hold the joints together in the finger. These ligaments join to form the joint capsule of the finger joint, a watertight sac around the joint. Arthritic finger joints cause pain and make it difficult to perform normal movements, such as grasping and pinching. Advanced arthritis can also loosen the joint and may begin to cause finger joint deformity. Joint fusion is a procedure that binds the two joint surfaces of the finger together, keeping them from rubbing on one another. Fusing the two joint surfaces together eases pain, makes the joint stable, and prevents additional joint deformity. On the day of your surgery, you will probably be admitted to the hospital early in the morning. You shouldn't eat or drink anything after midnight the night before. The length of time you spend in the hospital depends a lot on you. An incision is made on the back part of the finger over the surface of the joint that is to be fused. Special care is taken not to damage the nearby nerves going to the finger. The joint capsule surrounding the finger joint is then opened so that the surgeon can see the joint surfaces. The articular cartilage is removed from both joint surfaces to leave two surfaces of raw bone. The bottom of the phalange is hollowed with a special tool to form a socket. The other surface is shaped into a rounded cone that fits inside the socket. The soft tissues over the joint are sewn back together. The forearm and hand are then placed in a cast until the bones completely fuse together. This takes about six weeks. Problems can arise when the anesthesia given during surgery causes a reaction with other drugs the patient is taking. In rare cases, a patient may have problems with the anesthesia itself. In addition, anesthesia can affect lung function because the lungs donât expand as well while a person is under anesthesia. Be sure to discuss the risks and your concerns with your anesthesiologist. Any operation carries a small risk of infection. Finger fusion surgery is no different. You will probably be given antibiotics before the operation to reduce the risk of infection. If an infection occurs you will most likely need antibiotics to cure it. You may need additional operations to drain the infection if it involves the area around the fusion. There are nerves and blood vessels near the finger joint. Since the operation is performed so close to these important structures, it is possible to injure either the nerves or the blood vessels during fusion surgery. The result may be temporary if the nerves have been stretched by retractors holding them out of the way. It is uncommon to have permanent injury to either the nerves or the blood vessels, but it is possible. Sometimes the finger bones do not fuse as planned. This is called a nonunion, or pseudarthrosis. (Pseud means false, and arthro means joint; a pseudarthrosis refers to the motion at a false joint.) If the motion from a nonunion continues to cause pain, you may need a second operation to try to get the bones to completely fuse. This may mean adding a bone graft and making sure that any metal pins that have been used are holding the bones still to allow the fusion to occur. After surgery, you will wear an elbow-length cast for about six weeks. This gives the ends of the bones time to fuse together. Your surgeon will want to check your hand in five to seven days. Stitches will be removed after 10 to 14 days, though most of your stitches will be absorbed into your body. You may have some discomfort after surgery. You will be given pain medicine to control the discomfort. What should I expect during my rehabilitation period? As mentioned, you'll wear a cast on your arm and hand for about six weeks to give the fusion time to heal. When the cast is removed, you may have stiffness in the joints closest to the fused joint. If you have pain or stiffness that doesn't improve, you may need a physical or occupational therapist to direct your recovery program. The first few therapy treatments will focus on controlling the pain and swelling from surgery. Your therapist may use gentle massage and other hands-on treatments to ease muscle spasm and pain. Then you'll begin gentle range-of-motion exercise for the joints nearest the fusion. Strengthening exercises are used to give added stability around the finger joint. You'll learn ways to grip and support items in order to do your tasks safely and with the least amount of stress on your finger joint. As with any surgery, you need to avoid doing too much, too quickly. Your therapist's goal is to help you keep your pain under control, improve your strength and range of motion, and regain your fine motor abilities with your hand and fingers. When your treatment is well under way, regular visits to your therapist's office will end. Your therapist will continue to be a resource, but you will be in charge of doing your exercises as part of an ongoing home program.